Students interested in pursuing a master’s degree in social work from Wilfrid Laurier University have a new program format to consider. 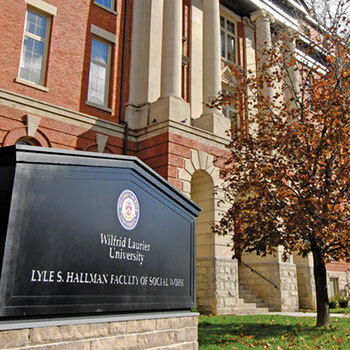 In spring 2018, Laurier’s Lyle S. Hallman Faculty of Social Work will offer its prestigious Master of Social Work (MSW) degree in a fully online format. The MSW is one of Laurier’s signature programs, and has a longstanding reputation for specializing in critically reflexive clinical and community practice. The online program, the only one of its kind in Canada, offers an advanced standing degree stream for those with a Bachelor of Social Work (BSW) and a traditional MSW program (for those without a BSW). Both programs are offered part-time, allowing students to balance their studies with work or family commitments. The MSW: Advanced Standing degree includes core courses in family social work and reflexive practice, and requires students to complete 546 hours of supervised field experience. The program can be completed in 16 months. Students in the traditional MSW program will be introduced to ethical thought and reflexive practice, basic tenets of social work, and research and evaluation skills. The program can be completed in 32 months and requires two field placements. Both programs have received accreditation from the Canadian Association for Social Work Education (CASWE). Buzza, along with faculty colleagues Professor Lea Caragata and Associate Professor Ginette Lafrenière, led the development of the new online programs. The team worked in unison with an instructional design specialist from Laurier Teaching and Learning to adapt course content for a fully online learning experience. Students will use Laurier’s online learning environment, MyLearningSpace, to access course materials, participate in discussion boards, submit assignments, and complete examinations. Lafrenière, who is also the director of the Manulife Centre for Community Health Research, expects graduates from the online MSW program to be as sought after across the social work profession as those completing the in-class program. More information on Laurier’s online MSW programs, including application details, is available at online.wlu.ca.